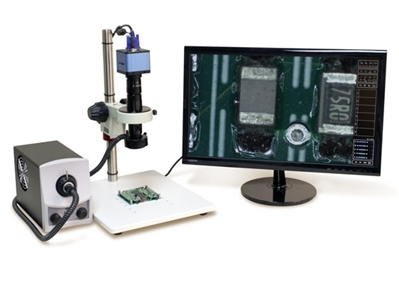 Micro Zoom Video Inspection System with HD Color Camera with Built in Measurement Software and SD Card for saving images. White LED Fiber Optic Illumination mounted on our Heavy Duty Post Stand and a 19" LCD Monitor. Magnification range 14.25 to 190x. This package consists of the following items: Micro Lens Zoom 640 with Detents, 1X Coupler and 1X Objective Lens mounted on our Heavy Duty Post Stand coupled with our rack and pinion focus mount with coarse and fine focus, HD Color Camera with Built in Measurement Software, a 19" LCD Color Monitor and white LED fiber optic illuminator with ring light for shadow free illumination. Also included with this system is a 0.5x objective lens to extended the working distance and field of view. With the 1x objective lens this system produces a magnification range of 28.5x to 190x at a working distance of 82mm. Field of view is 6x8mm at low magnification and 0.9x1.2mm at high magnification. With the included 0.5x lens the system will produce a magnification range of 14.25x to 95x. Produces crisp clear images; PC not required for image processing. View object on large 19" LCD color monitor. Large magnification range 14.25x to 190x. White LED Fiber Optic Illumination. HD Color camera with USB mouse control and Built In Measurement Software. Measure lines/distance, circles, arcs, squares, polygon, perimeters, angles, center to center distance. On screen menu for controlling color, contrast, white balance etc. Compact system, helps save bench space. Heavy Duty Post Stand provides stability and eliminates vibrations. 10 machined holes for extra mounting options.